It’s a wonderful time of the year and the warmer winter most of us experienced has brought beautiful blooms to our gardens sooner than expected. Spring is here and Easter is right around the corner. With the Easter holiday in mind we had to share this classic holiday look . We think everyone will love it. It’s the new Bunny Calla Lily Plant at CalyxFlowers.com and we’re giving it “Best Flower” for the week. Don’t you just love a beautiful bunny rabbit? Aren’t calla lilies so intriguing? When we incorporated the two together it turned into a true celebration of Easter! 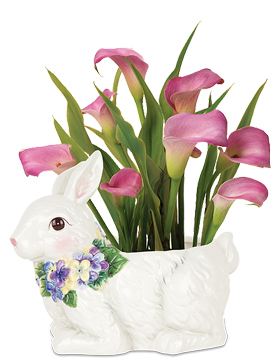 Although the “Easter Bunny” part of the holiday is separate from the Christian tradition of honoring the day Jesus Christ rose from the dead, we like that we’ve filled it with a calla lily. White callas are believed to be a symbol of Jesus’ Resurrection, as the shape of the blooms bear a resemblance of trumpets, and the trumpets stand for victory. So there you have it. The bunny gets best flower. Happy Easter!